The package arrived in a fashion that I'd soon learn marked the sender's breed—an oft-resused envelope, repeatedly patched with clear tape. It looked like hell. But it really didn't matter because I greedily tore the thing open to get at the juicy contents—a promised set of pictures from WWII. I remember the day distinctly— it was a late-summer afternoon in 2001, typically upper-Plains; balmy, dry, a stiff breeze...but a timbre in the air bears a warning of the fierce cold to come. It's as if the atmosphere is nudging, "Enjoy it now." So I did. Right there in the driveway, thumbing through the stack of ancient images bearing the patina of six decades. A colleague happened to be at my house and we looked at them together. They were images of life at a place called "Bodney, England," home of the 352nd Fighter Group during WWII. Most of them were candid shots of pilots and crew clowning around, smoking cigarettes—glimpses of a past well-known to History geeks lucky enough to get their hands on "great-grampa's shoebox" of memories. I zipped through the photos, looking for extremes—maybe a wrecked airplane or cockpit shot of a victorious pilot...my associate, however, didn't move as fast and collected my cast-offs in one hand while giving the others a bit more time. He paused over a particular picture and stated, "Uh...did you notice these ones?" He removed four or five images from the stack in his palm and handed them back to me. Indeed, these pictures were different. The paper was thicker and brittle, showing tiny cracks in the shellac-like film finish. The photo's edge was trimmed in the old-style fashion of tiny jags and the photo quality was especially grainy, looking as if it had been developed in a cellar. Then, I remembered that the sender, fighter pilot Robert "Punchy" Powell, had told me to keep my eye out for a set of particular images as they were special to him. 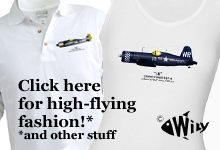 They featured Jaime Laing, a WWII POW who was part of Punchy's squadron. Behind each of these photos were yellow sticky notes scribed with impeccable cursive handwriting. "Geez! You gotta read this! These are pictures of a guy with the French Underground!" He flicked the yellow notes with his finger and gently rubbed the photo between his finger and thumb. "This is original stuff! Holy Sh*t! And he just mailed them to you?!" "He's crazy! This needs to be in a museum!" This is Jamie Laing. The other two guys are French Maquis. Indeed. The photos were of Lt. Laing shortly after he'd been shot down over France in April of 1944. The images showed Jamie, dressed (as well as possible) to look like a native Frenchman in order for the Resistance to easier sneak him out from under the noses of eager, angry Germans. That the French Resistance would perform such services to Allied fliers was not uncommon. That the French Resistance would allow their faces to be photographed was extremely uncommon. However, these weren't typical Resistance fighters; they were the Maquis—guerrillas so bad-assed, they resigned to death regardless if the Krauts knew their faces or not. I'd remembered my conversation days prior with Punchy— "Ah'was flyin' the day Jamie was shot down. Sad, sad day for us. But, ah'got photos of him with the French Resistance. Ah'want yuh'to see them as they were secreted out'a France. It's important you know about this." I then knew that my associate had an important point—the old man had sent something extremely valuable. 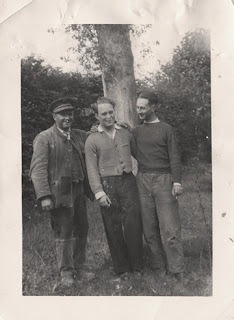 Suddenly the photos I casually clenched became delicately precious and I was instantly aware of the thread that had connected me to a secret French hedgerow so many years prior. My drawing of Punchy's P-51B. Though I've improved a lot since these first pieces, it remains so steeped in meaning, I keep it displayed in my studio and is mostly likely the first one I show visitors. Did they belong in a museum? Probably. But would these pictures have made the same impact viewed through a glass case or jealously guarded by a tweed-coated PhD? I can't say. But I do know that later that night, I called Punchy to admonish him for not sending copies or scans. How could he trust me, an unknown person known only by postal address?! "You need to see them. And ah'm not worried about their care. Ah'trust you." The man who sent me these photos died this morning. I expected it as did so many others, but it still feels like a whack to the chest with a baseball bat. I let my dad know just a few minutes ago and he, who'd met Punchy just once, knew enough to state, "He was a great man." Punchy Powell lived to keep the memories of his generation alive and vital. He loved the idea of moving knowledge forward, of passing wisdom onto others for their benefit. And he was tireless, too. In the years that I knew him, he collected and connected people by the thousands (around the world) with an uncanny charm that made anyone with him feel like they were his sole chosen heir. Do yourself a favor and Google "Punchy Powell." The man was extraordinary. It takes an extraordinary person to trust a rank-nobody with priceless things. Punchy invited fresh acquaintences into his home to see WWII memorabilia, signed countless autographs for kids (and adults), appeared on this-that TV show...handing out the experience of his generation like candy and never asking for a nickel in return. Those left behind will fill that vacuum as Punchy will never be forgotten. Punchy and his wife Betty on Normandy Beach, April 2003. 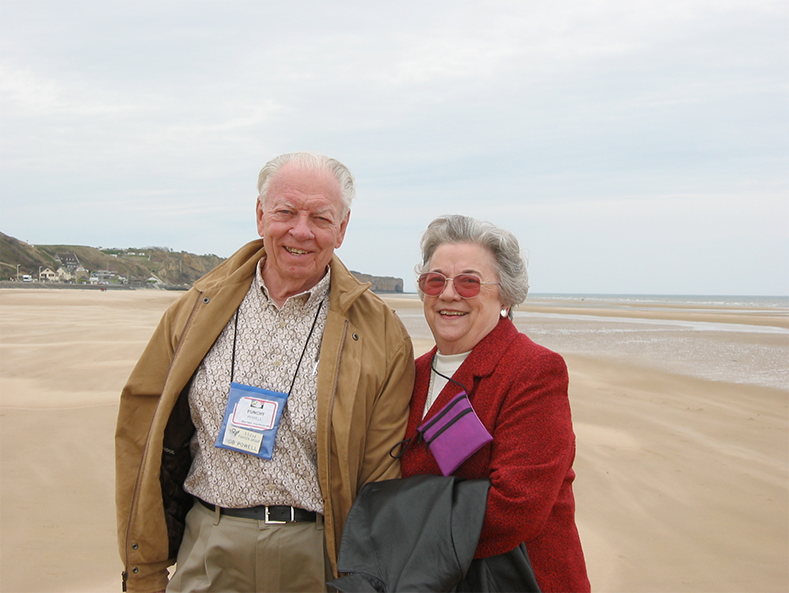 I took this photo shortly after he described flying over the D-Day beaches on 6 June, 1944. If you've never had the chance to talk to someone who has seen History happen, do your soul the favor and make it happen. 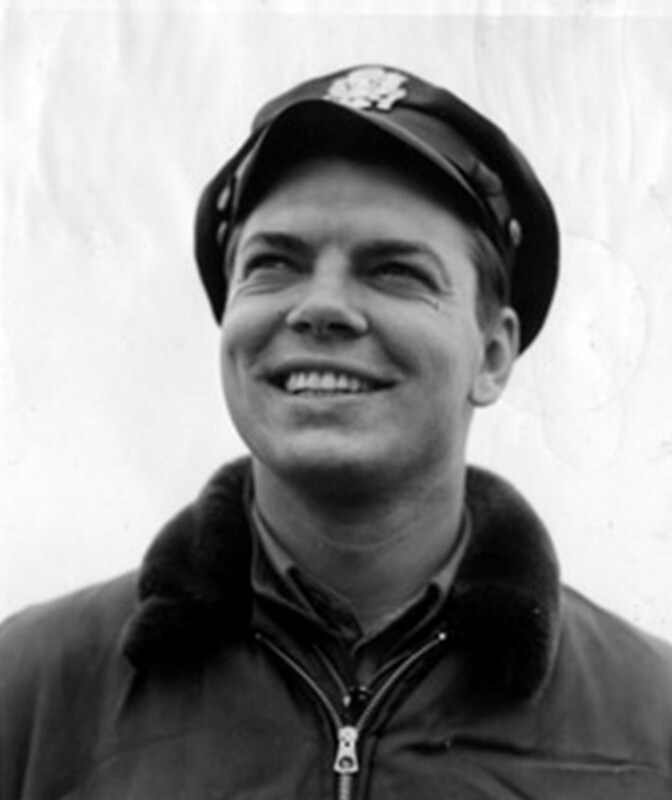 Note: Punchy flew 87 combat missions and is credited with 6 aircraft destroyed (4.5 on the ground, 1.5 in the air). Though he'd be the first to tell you that he was a "nobody" in the 352nd FG, post-war, he became the face and voice of anyone who'd ever served with the famous "Blue Nosed Bastards of Bodney." 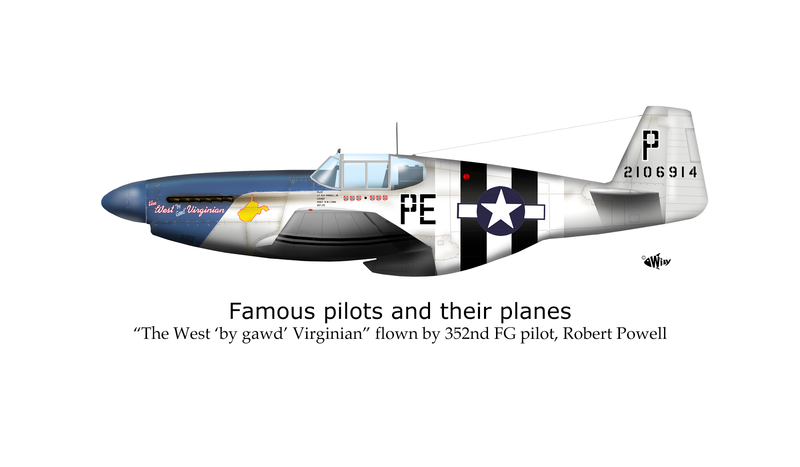 Though my artwork of his P-51B was almost seven years old at the time, his post was among the first that went online with the inauguration of this Blog. Click here. Video stories from Old Guys I've interviewed. I've been drawing airplanes since I was 3 and haven't stopped. Along the way, I got to know the pilots and crew...and this blog is a result. 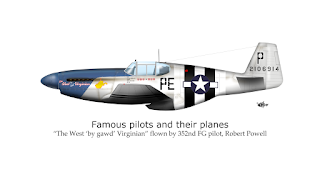 Many of the airplanes in my blog have been made into prints, signed by the airman who flew it into combat. If you are interested in any of these prints, email me or go to my website to purchase.